Alto clarinets aren't a common sight in the UK, being a much more popular feature of US wind sections. Nonetheless, we have much admiration for this unique instrument here at Dawkes Music. Whether you are on the lookout for an alto clarinet used or new, we are confident of being able to bring you the perfectly suited option at the right price. What is an alto clarinet? In terms of size, the alto clarinet lies between the soprano clarinet and the bass clarinet. Its appearance is more reminiscent of the latter than the former. it is typically made from wood, ABS plastic, along with a curved neck and a bell made of metal. The alto clarinet is very similar in appearance to the modern basset horn, although there are several vital differences. Not only is an alto clarinet typically pitched a tone lower, but it also doesn't have the basset horn's extended lower range, or as narrow a bore as many basset horns have. 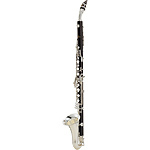 You may be especially interested in an Eb alto clarinet for use in a harmony band or symphonic band. It's much rarer to see such an alto clarinet in a classical symphony orchestra. However, Hector Berlioz was an admirer of the alto clarinet, describing it as "a very beautiful instrument which ought to take its place in all well-established orchestras." The development of the alto clarinet is closely tied to the basset horn. Indeed, Joseph Fröhlich wrote in 1817 that Ivan Müller "created the alto clarinet from the basset horn. His service in this regard is to have removed the unnecessary bass notes of the basset horn, thereby ridding the instrument of the dull, covered sounds it made, and by this means gaining an instrument capable of great power." By the early 19th century, alto clarinets were regarded as an improvement on the early basset horn. While Müller is widely credited as having invented the alto clarinet in collaboration with Heinrich Grenser, and was performing on a 16-key alto clarinet in F by 1809, alto clarinets pitched in G arguably existed as far back as 1740. Whatever your reasons for wishing to purchase an alto clarinet, or for that matter if you require the ideal alto clarinet mouthpiece or even alto clarinet reeds, we can serve your requirements right here at Dawkes Music – at very reasonable prices.